Successfully Added USB-C Multiport - For MacBook Pro, HDMI Port, Thunderbolt 3 Port, USB-C, Two USB 3.0, Micro SD, Regular SD Card Slot to your Shopping Cart. 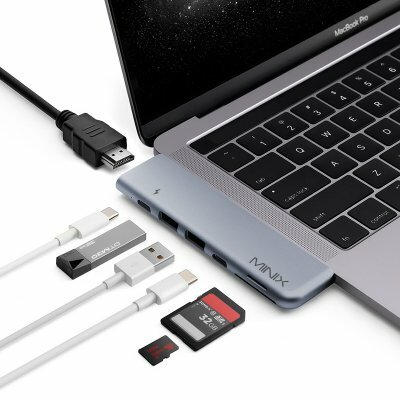 Significantly increase your user experience for your MacBook Pro with this useful USB-C Multiport. Designed to work specifically with all models of the MacBook Pro, this PC accessory treats you to 7 additional ports to be enjoyed from your MacBook. Simply plug it into your laptop, and you’ll have instant access to an HDMI port, Thunderbolt 3 port, USB-C, two USB 3.0, Micro SD, and regular SD card slot. With all these additional ports at your disposal, you’ll be able to take your user experience to the next level. From now on, you never have to worry again about how to attach external cables and gadgets to your MacBook Pro. The Thunderbolt 3 port supports a whopping 100w power delivery thanks to which it can be used to charge any model of MacBook Pro at lightning speeds. You’ll furthermore be able to transfer Ultra-HD media in 4K resolution and the Thunderbolt 3 port even supports 5K. Thanks to this, you can enjoy the latest media of your liking in absolutely stunning beauty without experiencing a loss in quality. With 40GBs data transfer speeds, this USB-C hub will never encounter any lag. Simply plug it into your MacBook Pro, and enjoy limitless possibilities with 7 new ports at your disposal. This USB-C Multiport comes with a 12 months warranty, brought to you by the leader in electronic devices as well as wholesale PC accessories..